ABILENE, Texas — Walter Meller doesn’t mind getting down and dirty if it helps the Crime Stoppers organization in Abilene, Texas. And that’s just one of the reasons why Meller was recently honored as the Crime Stoppers Board Member of the Year in Texas. Meller, who retired from West Texas Utilities in 1994 following a 35-year career with the company, has been a Crime Stoppers board member in Abilene for 23 years. Meller has raised the visibility of the Crime Stoppers program in Abilene, and it all started when he came up with a novel idea and decided to talk a little trash with the city’s Refuse Department. Meller’s idea was to stencil the Crime Stoppers name and telephone number on the city’s commercial refuse containers. 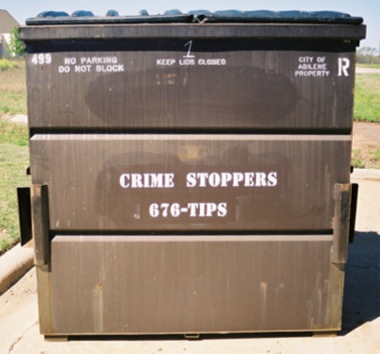 The Crime Stoppers name and telephone number — “Crime Stoppers, Call 676-TIPS” — now appears on about 3,000 refuse containers in Abilene. “Later, we talked the city’s Refuse Department into stenciling the containers when they refurbished them,” he added. .
Meller, who was system project engineer at the time of his retirement from WTU, also played a major role in having 155 signs with the slogan, “Crime Doesn’t Pay, Crime Stoppers Does, Call 676-TIPS,” placed throughout the Abilene area. “Keeping the Crime Stoppers name and telephone number before the public is important,” he said. In addition, Meller initiated a number of other publicity-gaining activities, such as writing guest editorials; placing the Crime Stoppers message on business marquees; placing “wanted posters” in the post office; encouraging organizations to place the Crime Stoppers message in their newsletters; and having the Crime Stoppers message printed on stickers that can be placed on restaurant menus. Meller played a major role in having signs and billboards put up around Abilene to promote the city's Crime Stoppers program. $1,633,146 (street value) of drugs seized. 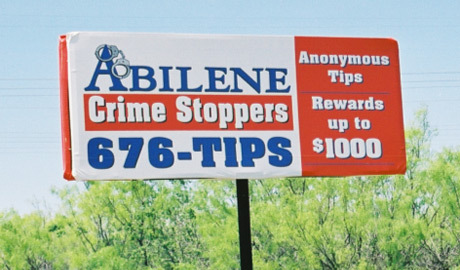 Meller played a major role in having signs and billboards put up around Abilene to promote the city’s Crime Stoppers program. Yet another unique idea that Abilene’s Crime Stoppers organization uses is a “Wheel of Misfortunate” public service announcement that can be seen regularly on local television stations. “Basically, we have a roulette wheel showing the photos of 12 wanted criminals instead of numbers. The wheel spins and the pointer points to the photo of one particular individual. If a person calls our hotline with some information about that particular suspect and it leads to an arrest, he or she will get an extra reward,” he explained. Meller was also part of the team that worked together to plan and host the 22nd Annual Crime Stoppers State Conference, which was held in Abilene during the second week of October. “Accomplishments that lead to an award like this are not achieved in a vacuum, they require a tremendous team effort,” he said modestly. “For example, we’ve been successful in promoting unsolved crimes on billboards, but we have a board member who owns an outdoor sign company and has been very generous about making space available to us. The Crime Stoppers name and telephone number now appears on about 3,000 refuse containers in Abilene. bachelor’s degree in physics from St. Mary’s University in San Antonio and a bachelor’s degree in electrical engineering from Texas A&M. 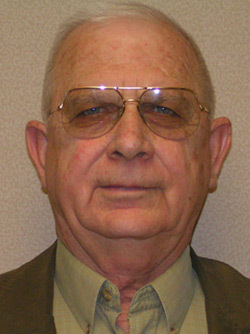 After his retirement from WTU, he worked another five years for the Wagstaff law firm in Abilene as a utility rate consultant. He and his wife, Beverly, have been married for 57 years and have four grown children, four grandchildren and four great-great-grandchildren. In addition to his work with Crime Stoppers, Meller also volunteers at the Abilene Regional Medical Center, where he writes and edits the newsletter for volunteers and takes photos of hospital-related events. Now 78 years young, Meller said he became interested in Crime Stoppers back in 1987. “I was invited to a Kiwanis Club meeting and heard a presentation about the Crime Stoppers organization in Abilene — at the time, it had been operating for only about six years.